Have you ever tried putting peanut butter and jam (or jelly) in a sandwich? It's a tasty combination. The buttery texture of the peanut butter (and crunchiness if you like the chunky variety) and the smooth jam plays in your mouth and the two flavors interchange and mix somehow. It doesn't matter what type of jam you have; in our case it's strawberry. I like using just one piece of loaf bread for my sandwiches. 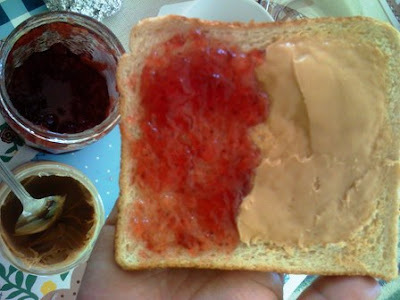 In this case, it's peanut butter on one half, and the jam on the other. Fold the bread in half and voila, you have a sandwich that doesn't look too difficult to consume and is easy to hold! Here's proof that the combination works. 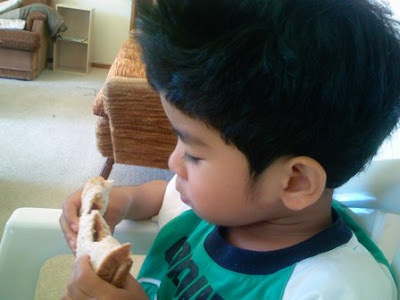 My son Jo-Lo is quite picky with his merienda (snack) but I gave him this sandwich. Voila! Two bites down, a couple more and the first serving is gone. PBJ sandwich is love! i prefer the crunchy variant of peanut butter w/ strawberry jam :D yummy! Dyosa: try it! It's fun.